Wounded Belgian soldiers at Morningfield Hospital. Food banks have become an increasingly common part of life in modern Britain. But details of an urgent plea for food have emerged from 1916, highlighting how a group of wounded Belgian soldiers were treated at Morningfield Hospital in Aberdeen. Fiona Musk, NHS Grampian archivist, who is investigating the role played by the city’s medical units in the First World War, said a photograph of wounded Belgian soldiers had added to the story. She said: “The hospital took in 89 patients between October and December 1914, with 16 left in hospital going into 1915. It was lent to the library by Arlene Grant, whose grandfather was one of the Belgian soldiers treated. But now, details of an urgent plea for food have emerged from 1916, highlighting how a group of wounded Belgian soldiers were treated at Morningfield Hospital in Aberdeen. The facility, originally known as the “Aberdeen Hospital for the Relief of Persons Labouring Under Incurable Disease”, opened its doors to support the war effort, after the beginning of hostilities in 1914. The hospital managers decided to set aside 30 beds for use by the wounded, but, at the request of the military authorities, this was increased to 40. 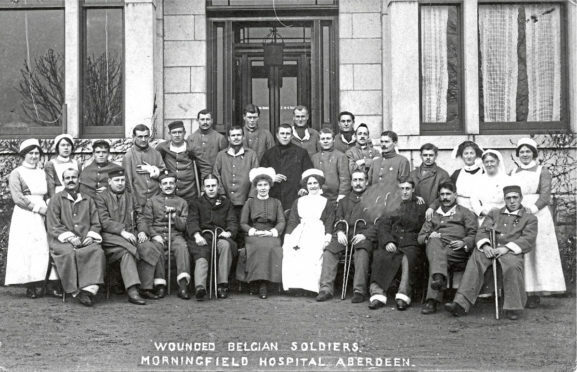 Fiona Musk, the NHS Grampian archivist, who is investigating the role played by the city’s medical units throughout the First World War, explained how a photograph of wounded Belgian soldiers held at Aberdeen Central Library had added to the story. It was lent to the library by Arlene Grant, whose grandfather was one of the Belgian soldiers treated at Morningfield. And it highlights how the conflict brought troops together from different countries and backgrounds. As the war raged on, with incessant fighting in the trenches, the effects were felt everywhere, not least in the Granite City. Food became scarce, even for those who were sick in the hospital where more than 1,500 soldiers were treated. An appeal was issued by the matron to local people in the city, asking them to dig deep and it had a straightforward message. It was reported in the Aberdeen Journal at the time: “The Belgian soldiers are very dependent on vegetables and fruit and, as the hospital garden is already depleted, the matron would be grateful for further supplies. Ms Musk said yesterday: “We are finding lots of information which paints a vivid picture of hospital life in the north-east from 1914 to 1918.